Home / Ricetta / Artichoke, chard and buffalo mozzarella strudel with anchovy oil. Artichoke, chard and buffalo mozzarella strudel with anchovy oil. Think that strudel is only good as a dessert? 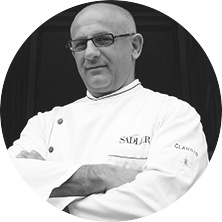 This recipe created by Michelin-starred chef Claudio Sadler will show you a new delicious option. 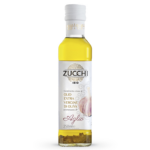 Here is a fresh, Mediterranean dish, where dolce fruttato (sweet and fruity) extra virgin olive oil and garlic flavoured olive oil are the stars. Mix the flour in a bowl with the warm water, dolce fruttato extra virgin olive oil, the egg and salt, working the mixture well to obtain a compact but soft dough. Rest the dough at a warm temperature (around 40°), covered with a sheet of baking foil. Prepare the artichokes by removing the spines, the tougher leaves and choke, and put them in water with a little lemon juice. Arrange them on a baking dish, pouring over a little dolce fruttato extra virgin olive oil, the two unpeeled cloves of garlic and basil leaves, and pour over white wine and a little warm water. cook them on the hob covered with an airtight lid for around 20 minutes. In the meantime cook the chard in salted boiling water, drain and cool in iced water. Then squeeze it without too much pressure and flavour it with the garlic flavoured oil, grated Grana Padano cheese, black pepper and nutmeg. Slice the mozzarella and leave it on some kitchen paper to dry. In a small saucepan fry the finely sliced garlic together with the oil and two spoons of cream, add the anchovy fillets and simmer for 30 minutes. Then puree in a blender and pass the sauce through a chinois. Keep warm. Roll out the strudel dough on a well-floured tea towel, add a layer of chard, followed by the artichokes chopped in half, and arrange the mozzarella slices. Close the strudel by rolling it onto itself, using the tea towel to help and sealing the edges well. Then transfer it onto a baking sheet and cover with a sheet of greaseproof paper with plenty of melted butter. Keep the strudel in the fridge for at least a couple of hours, and then bake it in the oven at around 200° for 15 minutes, brushing it with butter now and again. 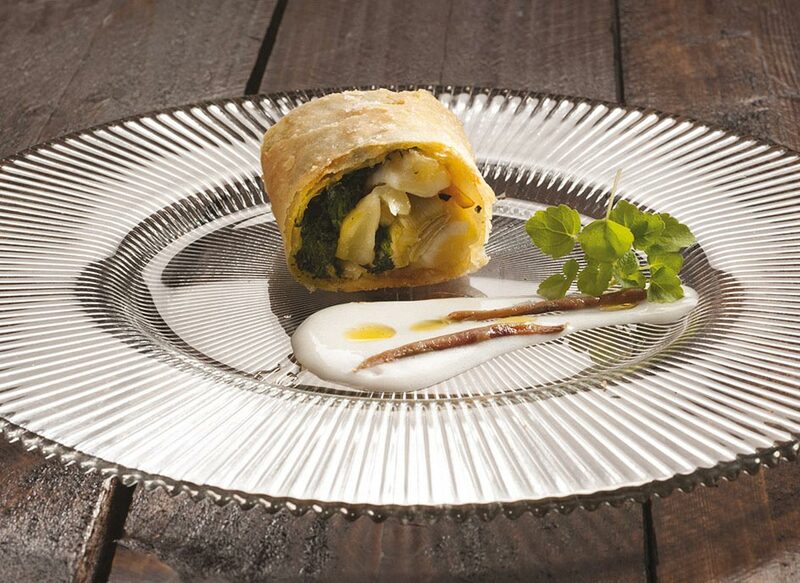 Serve the strudel in slices on a plate garnished with the anchovy oil.